Nearly 100% maintenance free, sealed for life lubricated components. There are only 2 grease lube points at the head shaft bearing. We manufacture efficient assembly conveyors which are equipped with digger teeth for positive material flow, an oversized barrel for minimum deflection over a time period and are exceptionally worn resistant. 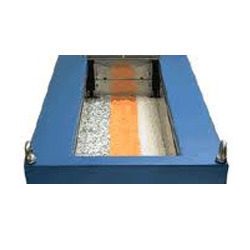 Being precision engineered our range of screw conveyors are used for conveying sand crescent or any other material in granular, powder, cake form, in mild steel and stainless steel. There is practically no rubbing action while operations of the machines so these assembly conveyors are easy to maintain. We offer finest quality Apron Conveyors that is manufactured using extreme quality raw material which is sourced from trusted industries. 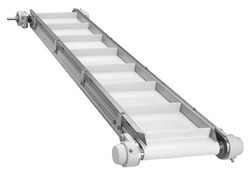 We offer these Apron Conveyors in various sizes. 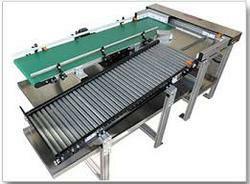 These Apron Conveyors are renowned for fine quality and high performance. We do quality checking of these Apron Conveyors before delivering these to our valuable clients. Generally, temperature of as trimmed forgings ranges between 950 to 1050 Deg. C. If all these jobs collected in pallet, it takes long time to cool. Microstructure, hardness and other physical properties will vary from job to job. A slow moving Slat Conveyor after trimming press provides sufficient time to cool the job below eutectoid transformation temperature before collection in pallet. Provides sufficient time to cool the forging. Residance time of forging on conveyor can be varied by using variable frequency drive. Lowest linear speed like 0.2 mtr / min is possible. 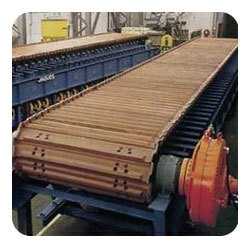 Forgings are rested on slats so conveyor can give trouble free long life. For medium sized forgings, normalizing can be done without any additional arrangements like hood , fan or blower. Offered feeder gates are manufactured under the guidance of experienced engineers, using optimum quality material, obtained from the authentic vendors of the market. 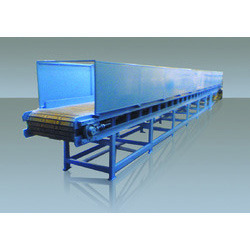 These Belt Feeder comply with the established norms and standards of the industry. Belt Feeder is rigorously examined before the end delivery to the customers, so as to ensure its flawlessness and quality. Looking for Apron Conveyors ?